North American Bear 17'' X 18.5'' Farm Animal Activity Mat by North American Bear at Time For Everything. SKU: 147831. MPN: 6208. Hurry! Limited time offer. Offer valid only while supplies last. Farm Animal Activity Mat is an exquisite baby safe keepsake treasure for the nursery in padded velour, tricot and cotton with appliqued barn. 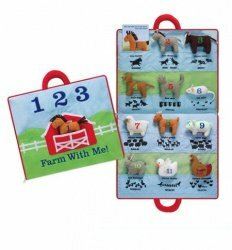 Farm Animal Activity Mat is an exquisite baby safe keepsake treasure for the nursery in padded velour, tricot and cotton with appliqued barn. Handled carrying case with zipper closure includes a d ounce en numbered miniature soft farm friends in silk screened pockets to encourage counting fun. Beautifully designed gift to go is a convenient travel toy and can be hung by the handle for nursery or playroom decor. If you have any questions about this product by North American Bear, contact us by completing and submitting the form below. If you are looking for a specif part number, please include it with your message.